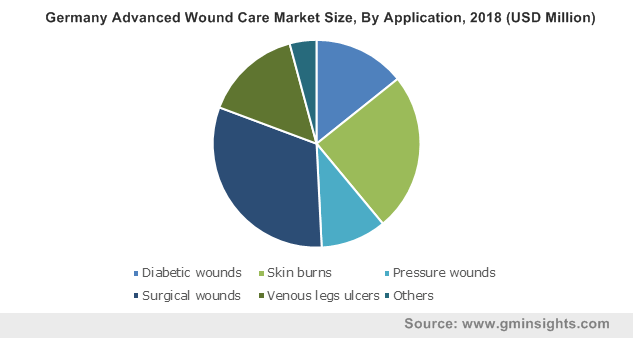 Advanced Wound Care Market size was valued at USD 9.8 billion in 2018 and is expected to witness more than 5% CAGR from 2019 to 2025. Increasing incidences of chronic diseases such as diabetes, obesity and consequent rise in incidences of chronic wounds will drive the market over the forecast period. Impaired or delayed wound healing in chronic diseases as well as after surgical procedures poses serious threat to patients and put them at risk of infection, amputation and even death. As a result, unmet need of superior healing technologies that enable rapid healing is prevailing in the global wound care industry. Rising geriatric population base that are at high risk of developing chronic wounds will support the demand of advanced wound care products. Rising patient pool suffering from chronic wounds causes significant cost burden on healthcare systems across the globe. The existing and rising cost burden of these chronic wounds is predicted to drive the investments in advance wound care technology rendering significant positive impact on industry growth. However, prohibitive cost of advance wound care products that often undermines treatment affordability will impede the industry growth in foreseeable future. 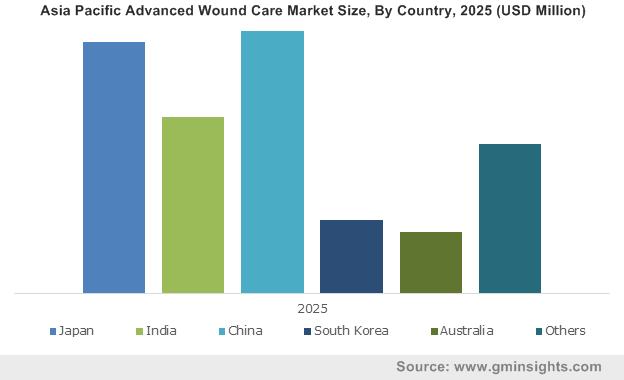 Wound dressing was valued at USD 5.4 billion in 2018 and is expected to retain its dominant position in the industry throughout the analysis period. Increasing awareness pertaining to the benefits of advanced wound dressing and its gradually increasing adoption will augment the segment growth. However, traditional wound dressings are still used in developing and underdeveloped regions due to low cost that is expected to impede segment growth to some extent. Wound therapy devices will witness more than 6% CAGR from 2019 to 2025. Negative pressure wound therapy (NPWT) currently represents lucrative growth opportunity amongst all devices. NPWT effectively treats acute as well as chronic wounds and have several benefits compared to other methods such as early discharge, easier transfer to other healthcare settings, and minimizes the frequency of wound dressing changes. Such advantages will enable NPWT to retain its market share over the forecast period. Diabetic wounds application segment is forecasted to witness 5.9% CAGR over the analysis period. Diabetic foot ulcers are responsible for significant mortality and morbidity in patients with diabetes mellitus. Prevalence of diabetic foot ulcers is forecasted to grow rapidly over the coming years. Increasing prevalence of obesity, lifestyle changes, and unhealthy eating habits are further expected to support growing prevalence. Rising number of diabetic foot ulcer patients should generate huge demand for advanced wound care products. Surgical wounds application segment accounted for USD 3.1 billion in 2018 and is estimated to dominate the industry throughout the analysis period. Surgical wounds extend the hospital stay, cause huge economic burden and significantly hamper quality of life. Increasing number surgeries due to trauma, accidents and rising prevalence of chronic diseases will spur the market over forecast period. Hospital segment accounted for USD 4.1 billion in 2018. Significant number of patients suffering from chronic and acute wounds are treated in hospitals. Moreover, as the hospitals are well equipped with the infrastructure required for surgical treatments, most of the surgical treatments are conducted in hospital settings. This further supports the demand of advanced wound care products to treat surgical wounds and infections. Home care segment estimated to witness 6.9% CAGR from 2019 to 2025. Aging demographics and rising healthcare cost are predicted to shift preference from hospital to home care. Advantages associated with home care settings such as greater comfort for patient, reduced chances of hospital acquired infections and cost benefits will drive segment growth over the analysis period. North America market dominated the global industry with revenue USD 4 billion in 2018 and the scenario is likely to remain same over the forecast period. High and rising prevalence chronic and acute wounds and increasing number of surgeries will drive the regional demand. Moreover, high level of awareness and adoption of advanced wound care devices such as NPWT will augment regional growth in coming years. India market is estimated to show 7.8% CAGR from 2019 to 2025. The market is at initial stages of development and significant number of patients are still dependent on traditional wound care products. Moreover, the awareness pertaining to availability of advanced wound care products is limited. High cost of products further impedes the affordability of advance wound care treatments in India to some extent. Some of the key players in global advanced wound care market are Medtronic, Smith and Nephew, 3M, Derma Sciences, Acelity, Mölnlycke, Integra LifeSciences Corporation, Organogenesis, MPM Medical, Human Biosciences, Hollister Incorporated, Beiersdorf global, HARTMANN International, and Medline Industries. Inc. Key strategies adopted by major industry players include, acquisitions, mergers, distribution agreements and innovative product launch to strengthen product portfolio and garner higher market share. For instance, in July 2018, Mölnlycke completed acquisition of SastoMed GmbH, a German wound care company to expand its product portfolio and offerings in advanced wound care market. Wound care products, especially wound dressings, have been evolved over thousands of years as human try to find effective solution to stops bleeding and speed up the healing process. However, in last few decades the number of wound care products available in the industry have witnessed phenomenal growth. Today clinicians have plethora of dressings as well as other wound care products available to choose from. In late 1960, Dr. Winter discovered the importance of moist environment in the process of wound healing. Today most of the clinicians accepts moist wound healing for healable wounds. Along with the traditional and advanced wound dressings, wound care devices have also been evolved in last couple of decades. 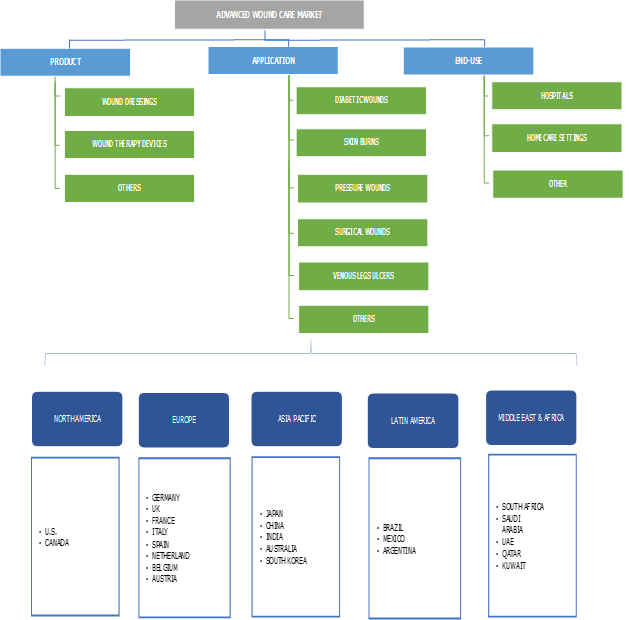 Most notable is the development of NPWT devices in 1990’s. The patient in developed economies are well informed regarding the benefits and availability of these advanced wound care products. As a result, the developed economies accounted for more than half of the revenue share in global advanced wound care industry. In developing regions, wound care industry is still in the initial stages of developments.